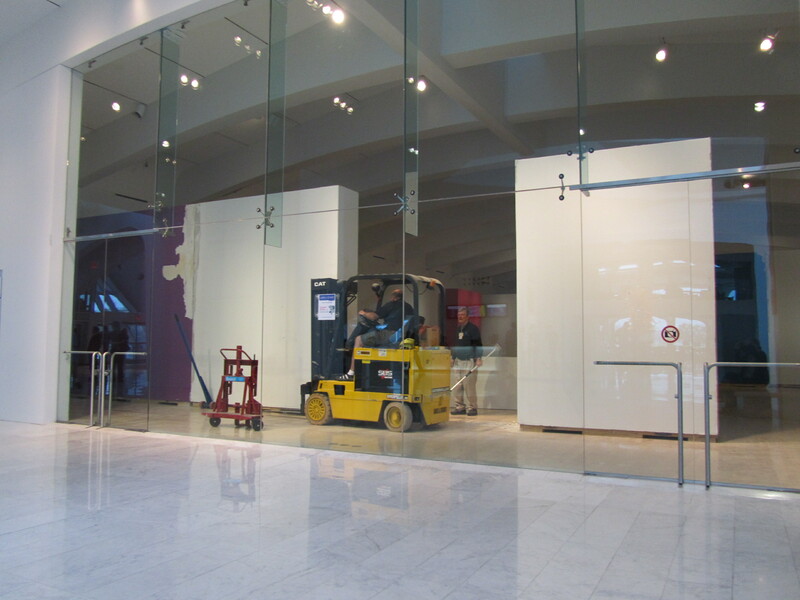 Forklift working to move Baker/Rowland gallery walls. 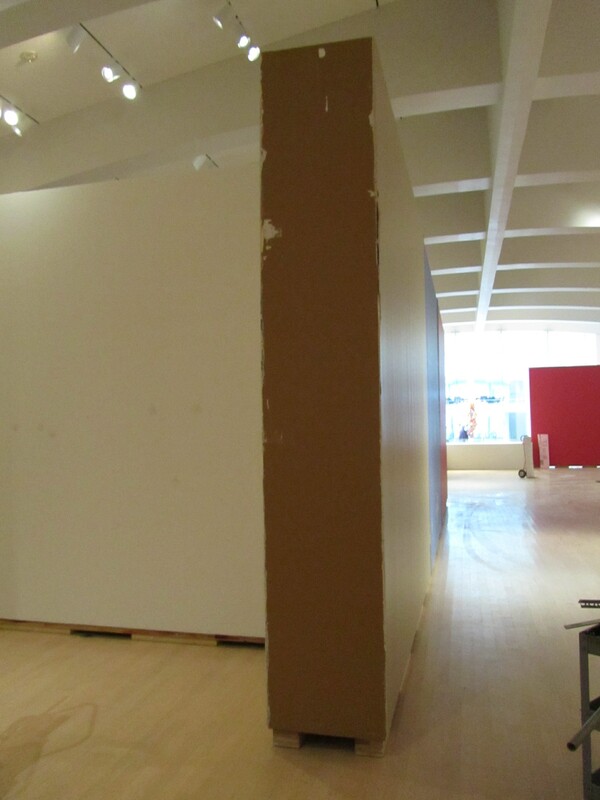 Between each exhibition in the Museum’s Baker/Rowland Galleries, the walls are entirely rearranged. 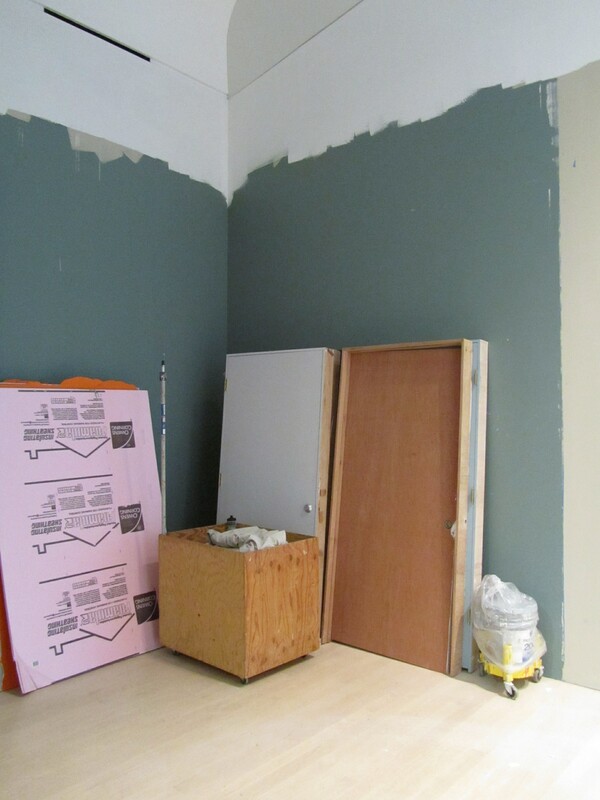 This past weekend, I watched (bringing donuts, getting in the way, occasionally being helpful) as the installation crew moved walls and started spackling and painting in preparation for European Design Since 1985: Shaping the New Century. As the team moved large 12 foot x 10 foot x 2 foot wall sections from their American Quilts exhibition layout into the new European Design arrangement, I was surprised at what was revealed behind—layers and layers of paint that colorfully represents our exhibition history. 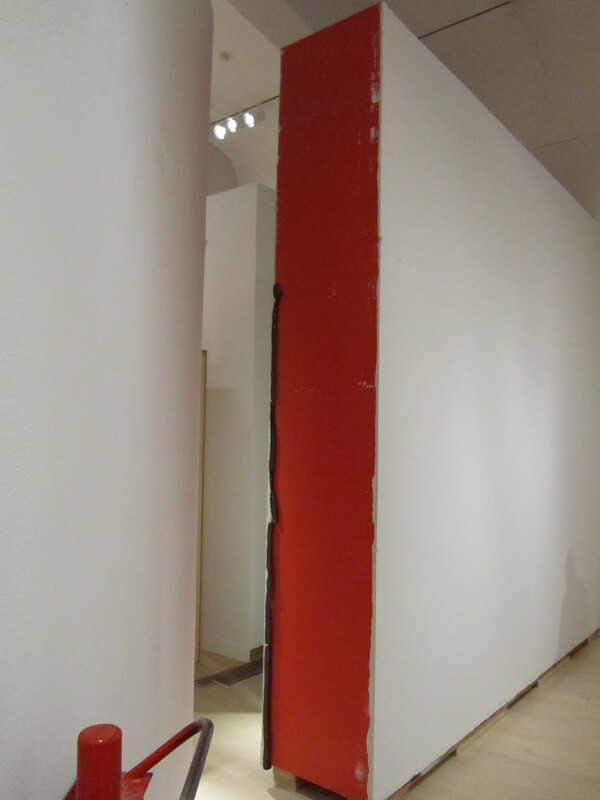 After any given exhibition closes and the art is removed and returned to storage or the lenders, the walls are immediately moved. The new arrangement often obscures (traps) some of the current paint, meaning it does not get repainted with the next show’s incoming colors. Pink and purple walls from "American Quilts: Selections from the Winterthur Collection"
For instance, we moved the pink and purple walls from the American Quilts exhibition into the arrangement in this photo (previously, the purple wall was at a diagonal dramatically displaying a large starburst quilt). 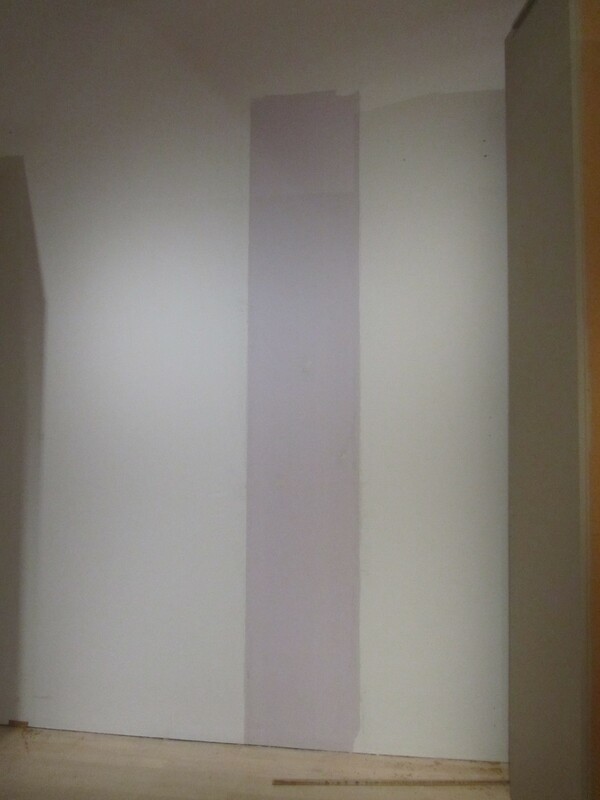 The surfaces you see here will be painted white, except for the strip of purple and pink on the short “ends” of the wall that are abutting one another in this photo. Those short ends were exposed in the Quilts arrangement. 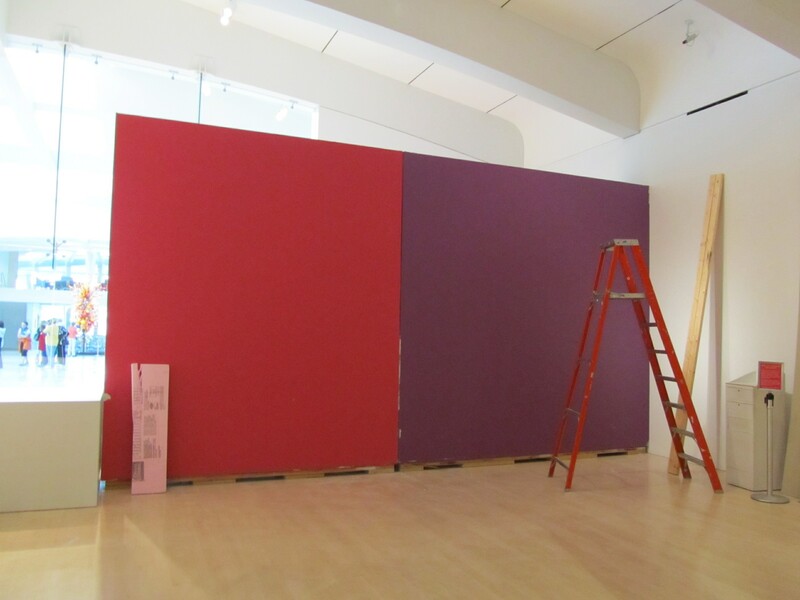 This winter when we again move those walls, we’ll separate them and reveal strips of pink and purple from Quilts. 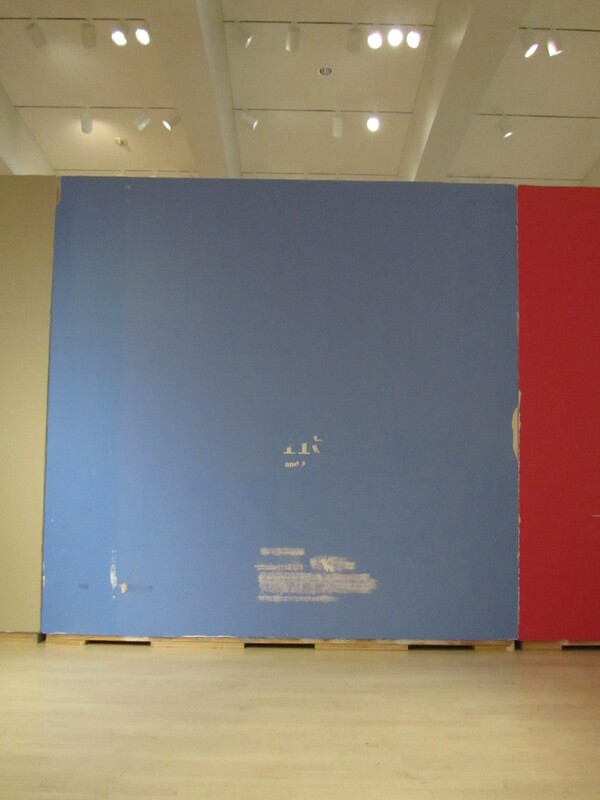 Red paint from "Street Seen: The Psychological Gesture in American Photography, 1940–1959"
Blue lead wall (with title remnants!) from "The Eight and American Modernisms"
Strip of pale purple from "The Eight and American Modernisms"
Brown paint from "The Artistic Furniture of Charles Rohlfs"
Mysterious green paint that no one seems to remember. Ideas? This entry was posted in Behind the Scenes, Curatorial and tagged American Quilts, Behind the Scenes, European Design Since 1985, Exhibitions, Installation. Bookmark the permalink.